4 Things Waiting Can Look Like? Who likes to wait on anything? Waiting can be difficult. Let's look at the definition of wait! If you're like me - certain words jumped out - DELAY! STOP! KILL TIME! Those all seem to make it seem negative. What about looking at the words - REMAIN IN READINESS, REST, PAUSE! I like those as they bring about a positive feeling. As most of you know the house we rent sold on 7/29 - unexpectedly and without advance notice. Well if you count 2 days notice, then we got notice. Patiently for the past 2.5 weeks, but who's counting, we've been waiting on the new owner/landlord to connect and discuss us continuing to rent here. Wednesday, he did reach out. He sent a lease for us to review and sign, but there were quite a few concerns with it. We sent it back with the items we wanted to have changed and then began the wait again. For whatever reason, we were stressed out over it. Me more than Ken. The enemy came in like a flood with every possible negative scenario. I prayed and asked God to please settle this lease issue. I asked Him to give us favor and that all the items would be addressed to our satisfaction. And the next morning a new lease came over and each and every item was corrected to our liking! Praise God!! He heard my cry and He answered. Though it was less than 15 hours in waiting for this resolve, it was a very long 15 hours. I didn't sleep a wink. P.S. So Wednesday night our new landlord came over to have us sign the month-to-month lease. We had a great visit, shared our vision and he was excited for us. He even told us that God told him to take good care of us! How's that for God's favor! Very exciting!! Have you ever had a situation like that? That all you could do was think, what if?? Ken and I have been believing and waiting on God for a very long time to step into the destiny He has for us. We have been seeing some definite signs and progress on many levels but yet the reality of it has not come to pass. The only hinderance is finances! God keeps promising us and reassuring us that He will make it happen. We have had confirmation after confirmation. Here's a few things I've learned and what waiting can look like? 1. Waiting can make you look foolish! Maybe we are! John Wimber quotes "I'm a fool for Christ, whose fool are you?" We'd rather continue to pursue what God is showing us and believe than stay stagnant and status quo in our walk. We are here to please God and faith pleases Him! Mark 9:23, if you can said Jesus, everything is possible for one who believes. As the definition above says - we are to remain in a state of READINESS!! 2. 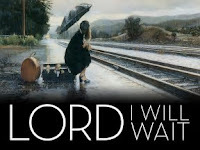 Waiting can give you the REST you need just as the definition above implied! Isaiah 40:31 but those who hope in the Lord will renew their strength. They will soar on wings like eagles' they will run and not grow weary, they will and not be faint. I want to soar! I want to run and not get weary! As much as I hate to admit it, this long season of waiting on God has been good for my physical health and my soul. My adrenals need rest to heal. If I was busy busy day in and day out, I would never get well. It has allowed me to hit the PAUSE button of life and grow more in the things of God. It has enabled me to spend quality and quantity of time with the Lord! 3. Waiting can leave you isolated. Some people's faith doesn't allow them to understand you and your dreams so they avoid you. And that can hurt. Romans 12:3b each according to the measure of faith that God has assigned. We don't expect you to completely understand our walk, it's not your walk, it's our walk! (Heck, we don't always understand - but we do the best we can walking out what we feel the Lord is showing us.) However, God also is so good to bring new people or some old friends alongside you - who will help you get to the next step. Thankful for that. 4. Waiting can bring great rewards! It builds character, faith, deeper trust in the Lord and His favor. Who doesn't need improved character and a deeper richer faith? Look at all the people God used in the Bible. They waited a lot longer than we have been waiting. 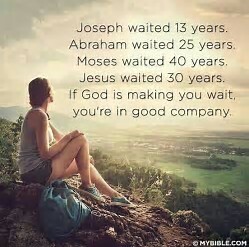 I hope we don't have to wait as long as they did....but if we do, then we know God has a reason for it. This devotional seems to hit the mark quite often this year, so I wanted to share it with you. Waiting is much more difficult than walking. Waiting requires patience, and patience is a rare virtue. It is fine to know that God builds hedges around His people--when the hedge is looked at from the viewpoint of protection. But when the hedge is kept around one until it grows so high that he cannot see over the top, and wonders whether he is ever to get out of the little sphere of influence and service in which he is pent up, it is hard for him sometimes to understand why he may not have a larger environment--hard for him to "brighten the corner" where he is. But God has a purpose in all HIS holdups. "The steps of a good man are ordered of the Lord," reads Psalm 37:23. On the margin of his Bible at this verse George Mueller had a notation, "And the stops also." It is a sad mistake for men to break through God's hedges. It is a vital principle of guidance for a Christian never to move out of the place in which he is sure God has placed him, until the Pillar of Cloud moves. When we learn to wait for our Lord's lead in everything, we shall know the strength that finds its climax in an even, steady walk. Many of us are lacking in the strength we so covet. But God gives full power for every task He appoints. Waiting, holding oneself true to His lead--this is the secret of strength. And anything that falls out of the line of obedience is a waste of time and strength. Watch for His leading. Must life be a failure for one compelled to stand still in enforced inaction and see the great throbbing tides of life go by? No; victory is then to be gotten by standing still, by quiet waiting. It is a thousand times harder to do this than it was in the active days to rush on in the columns of stirring life. It requires a grander heroism to stand and wait and not lose heart and not lose hope, to submit to the will of God, to give up work and honors to others, to be quiet, confident and rejoicing, while the happy, busy multitude go on and away. It is the grandest life "having done all, to stand." -We were so blessed this week by several people. A total stranger got my name from a local friend and brought me 4 boxes of fresh tomatoes (and a couple green peppers). Another friend brought us a bag of apples just picked off the tree. Another brought us 10 dozen farm eggs - that's probably over 100 dozen free eggs this year. We of course, enjoyed some ourselves, but also have shared with many here who have need. Had another friend from KC bless us with a visit and generosity. Another friend gave me a beautiful stock pot - thought I could put to good use as we are using our hospitality gift often. And another sent me a bottle of Mexican Vanilla recently. And even another purchased an online course for Ken & I to grow deeper in hearing God! God is so good and faithful to meet our needs & wants! -Ken is still getting some additional painting work - about 20-25 hours a week plus his part time job at Dollar General. We hope this continues - but please pray for his endurance as he is working 6 days a week - and often works back to back both jobs - making for long days. -I am still struggling with sleep, had a big adrenal crash this past week. With Ken's extra hours, it's meaning more household work for me. I can do it, but then I pay in pain and fatigue. Exciting news - I had 2 friends out of the blue message me and say they felt God spoke to them and told them my healing was coming very very soon! I believe it! God has been speaking to me that my healing is coming synonymous with our shift into destiny. I hope so and I hope soon!!!!! -Canyon is definitely showing signs of the end and I am struggling more than ever. I'm asking God for peace and perfect timing to put him down. It's probably already that time, but I just don't have the peace yet. Please pray that God will take him peacefully and with no trauma to him or us. -Ministry - Wow! Definite God signs and specific answers to prayers continue to make us think it's soon..... it's like a wave of excitement, then a lull, then a wave of excitement....etc Please continue to stand with us for the perfect timing and God's amazing provision to come forth! Thank YOU so much for your ongoing support, love and care for us and our ministry. We are honored to be able to pray for those who reach out to us. Please let me know if you have any prayer needs. If you have been blessed by this ministry or feel led to support what God is doing through us - financially, below are a few options. Your generosity and your prayer support is greatly appreciated and needed as we continue to walk in faith and God's calling. 2. Non tax deductible donations can be made directly to us by: THIS IS THE FASTEST WAY TO GET MONEY TO US FOR DAILY USE. God has given us a vision to build a retreat property along with ministry equipping center. The retreat portion of our ministry is to provide a safe place for pastors, lay leaders & other ministry folks to come and be refreshed & encouraged through prophetic ministry (if wanted). We will offer private cabins with kitchens & full bathrooms, and plenty of places to roam on the property to get quiet with the Lord. We will offer other specialty retreats - marriage, healing, prophetic teaching & activating people into the world & health and wellness retreats and more. The Lord has graced us with the desire to come alongside the Church - to bring healing, deliverance & freedom to new/newer believers. We are not wanting to replace their church, but better help them be ready to serve in their church. In our community building - we will eventually have a 24/7 prayer room, healing & prophetic rooms and a place for community worship services for those on the property. Our passion is to minister to a lost & hurting world. To equip the saints to do the same and to be a blessing to our community and surrounding areas. Our hopes are that we can pour out God's love in a mighty way to bring more and more souls into the Kingdom, get them discipled, called into their purpose & destiny and released to do God's business!!!! We also have a passion to give generously to help those in need and to help others launch into their God given destinies.